PLAYA VISTA, CA and BOCA RATON, FL – November 10, 2014 – WeMo®, the home automation ecosystem from Belkin International, and Mr. Coffee®, America's original coffeemaker, today announced availability of the Mr. Coffee Smart Coffee maker Enabled with WeMo. 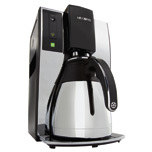 The third product stemming from a collaboration between WeMo and Sunbeam Products, Inc. doing business as Jarden Consumer Solutions, the Mr. Coffee Smart Coffeemaker features WeMo connectivity built-in and enables consumers to brew, schedule and monitor the device from anywhere using a smartphone or tablet with the WeMo app. "With more than 100 million daily coffee drinkers in the United States alone, coffeemakers have become an indispensable part of the kitchen and making coffee is a very personal ritual for a lot of people," said Ohad Zeira, director of product management for WeMo. "Having that first cup of coffee fresh and hot at the exact perfect moment makes the brew from anywhere, anytime aspect of the Mr. Coffee Smart Coffeemaker an enticing addition to the smart home." The Mr. Coffee Smart Coffeemaker enabled with WeMo is a smartphone-controllable coffeemaker which gives users remote access to all of the coffeemaker's functions. Perfect for busy weekday mornings and lazy Saturdays alike, the WeMo-enabled coffeemaker ensures coffee is always freshly brewed. Set a schedule to have coffee ready every weekday morning at 7:30 for the morning commute or hit brew from the dinner table so coffee's ready just in time for dessert during a dinner party. With the WeMo app, users can start or monitor the coffeemaker from anywhere. Through the app, users can also schedule a week's worth of brew times, check to make sure the coffeemaker has a full tank of water or the carafe is in place, setup reminders, and receive alerts when the water filter needs changing, or the coffeemaker needs to be cleaned. The Mr. Coffee Smart Coffeemaker enabled with WeMo also works seamlessly with the entire WeMo family of products and partner products. 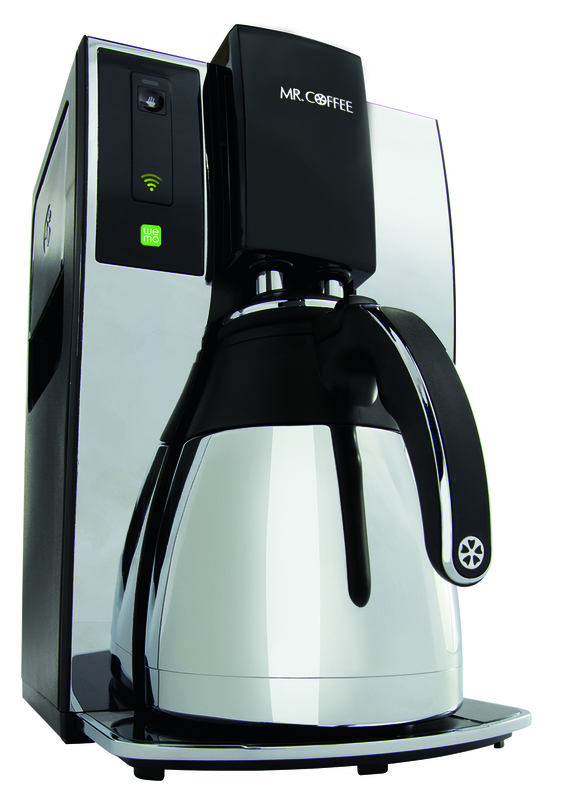 In addition to WeMo's connected capabilities, the Mr. Coffee Smart Coffeemaker is also a state-of-the-art, artisan-style coffee maker with optimal brewing technology for more flavorful, rich coffee. By heating up to an ideal brewing temperature of 205 degrees and a 10-cup, stainless steel thermal carafe, coffee stays hot until the last sip. Additionally, total brewing time for a full pot is just eight minutes, which is 20 percent faster than the average initial brew speed of the competitive coffeemakers tested. "Perfect for families or anyone with a busy, unpredictable schedule, the 10-cup Mr. Coffee Smart Coffeemaker enabled with WeMo brings a little bit of control and flexibility to hectic routines," said Alejandro Pena, President JCS USA. "While it's great in the morning, it's also perfect for entertaining, letting users live in the moment instead of in the kitchen." The Mr. Coffee Smart Coffeemaker enabled with WeMo is available now at Belkin.com, Mr. Coffee.com and Amazon.com with for an MSRP of $149.99. The WeMo app is available at no cost for download now at the App Store and Google Play Store. WeMo is Belkin's award-winning home automation brand and the leader in delivering customizable smart home experiences. Designed to be the most approachable entry point to the smart home, WeMo products and partner products empower people to manage, monitor and adjust their electronics, appliances and lighting from anywhere at any time via the free WeMo app. To learn more about WeMo, visit http://WeMothat.com/ or follow us on Facebook and Twitter. Jarden Corporation is a leading provider of a diverse range of consumer products with a portfolio of over 120 trusted, quality brands sold globally. Jarden operates in three primary business segments through a number of well recognized brands, including: Outdoor Solutions: Abu Garcia®, AeroBed®, Berkley®, Campingaz® and Coleman®, ExOfficio®, Fenwick®, Greys®, Gulp!®, Hardy®, Invicta®, K2®, Madshus®, Marker®, Marmot®, Mitchell®, PENN®, Rawlings®, Ride®, Sevylor®, Shakespeare®, Stearns®, Stren®, Trilene®, Völkl®, Worth® and Zoot®; Consumer Solutions: Bionaire®, Breville®, Crock-Pot®, FoodSaver®, Health o meter®, Holmes®, Mr. Coffee®, Oster®, Patton®, Rival®, Seal-a-Meal®, Sunbeam®, VillaWare® and White Mountain®; and Branded Consumables: Ball®, Bee®, Bernardin®, Bicycle®, Billy Boy®, Crawford®, Diamond®, Dicon®, Fiona®, First Alert®, First Essentials®, Hoyle®, Kerr®, Lehigh®, Lifoam®, Lillo®, Loew Cornell®, Mapa®, NUK®, Pine Mountain®, ProPak®, Quickie®, Spontex®, Tigex® and Yankee Candle®. Headquartered in Florida, Jarden ranks #356 on the Fortune 500 and has over 30,000 employees worldwide. For further information about Jarden, please visit www.jarden.com. WeMo® is a registered trademark of Belkin International; Mr. Coffee® is a registered trademark of Sunbeam Products, Inc; and Wi-Fi® is a registered trademark of the Wi-Fi Alliance.